Everyone who saw him on the ground knew something was terribly wrong. Several truck drivers, dispatchers, and a photographer knew the Osprey was badly injured. Two of them knew what they needed to do. 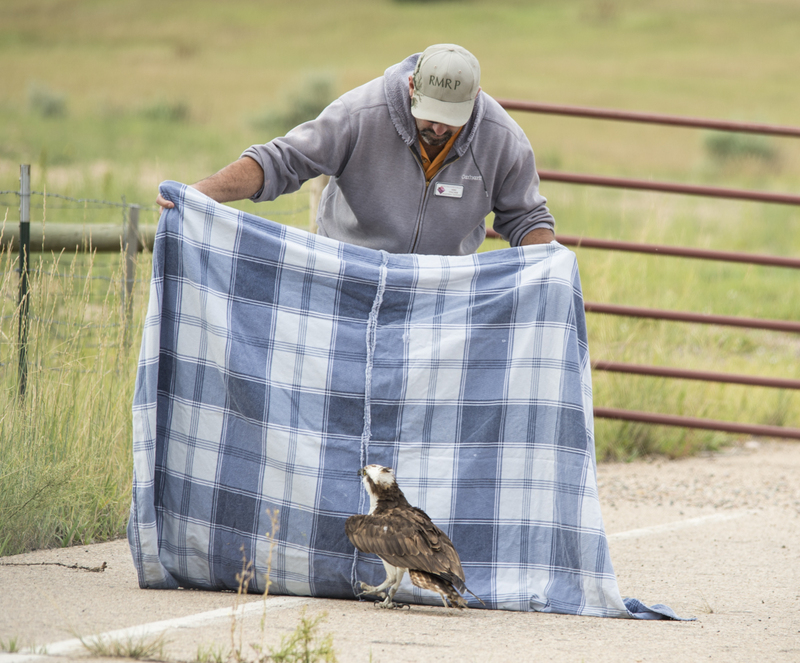 Very early on the morning of August 28, 2014, the emergency phone at the Rocky Mountain Raptor Program rang…twice. Abby Hadachek from Martin Marietta was on the line – an Osprey was on the ground, alive but not moving. Mike Tincher, RMRP’s Rehabilitation Coordinator and raptor rescue expert acted with more urgency than usual. He knew that downed Ospreys almost never survive in rehabilitation. He hopped into his Jeep and took off for the Martin Marietta Concrete plant at Ziegler and Drake in Fort Collins. Meanwhile, Marilu Theodore’s heart fell when she saw the Osprey on the ground. She was leaving the area after taking some early morning wildlife photographs when she saw him and called the RMRP emergency number. She learned that Mike was on his way. A dedicated raptor lover, she waited near the bird until Mike arrived. While waiting, she spoke to several Martin Marietta drivers and learned that the Osprey had been on the ground since the night before, decreasing his chances of survival. Mike’s mind was racing as he approached the bird. He could see that it was badly injured. Was there any chance of rehabilitation? Of all raptors, Ospreys are extremely difficult to manage in captivity. They experience severe stress around humans. Mike was racing against the clock! 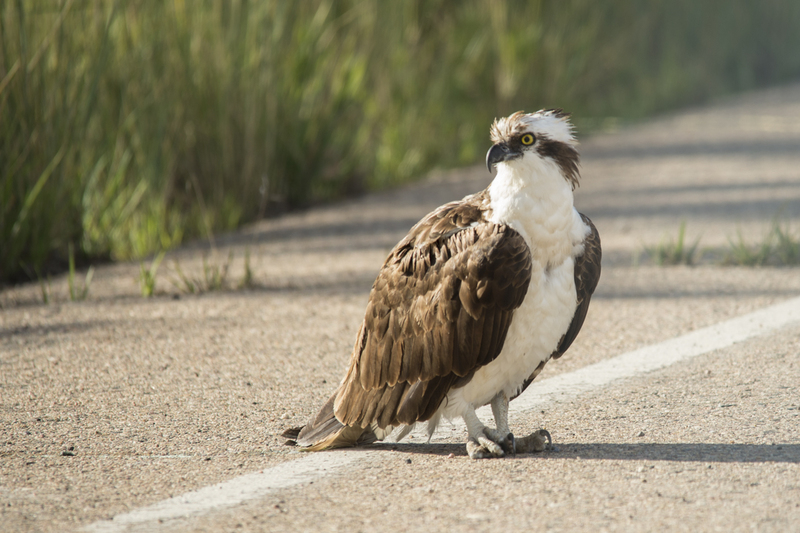 At RMRP, Mike and Rehabilitation Director Gail Kratz examined the Osprey. They found two severe left side injuries – each potentially life threatening – a broken upper wing bone near the shoulder, and the leg was dislocated at the hip. The team was deeply worried. The shoulder break wasn’t clean, but surgery was not an option because the break was too close to the shoulder. The best we could do was bandage the wing so it wouldn’t move during the healing process. We popped the femur back into its proper position. His condition was extremely critical, and would require days of one-to-one, closely monitored care by our most experienced staff. With so many strikes against him, this osprey had an extremely guarded prognosis. In this case, our staff knew exactly what to do. They placed him in the smallest possible enclosure to reduce movement, in a dim and quiet location to minimize stress, and played a Sounds of Nature CD to mask background noise. He was fed the finest whole fish diet of freshly caught rainbow trout. He wasted no time digging in, thanks to our friends at the Colorado Division of Parks and Wildlife Fish Hatchery. He spent 11 days with restricted movement in our outdoor hospital enclosure. His bandage was removed and he was moved to a larger recovery enclosure. Just two days later, only 13 days after sustain life-threatening injuries, he started flying and maneuvering in the small enclosure! Hovering is an essential skill for Ospreys as they watch from 30’-100’ above the water for fish below the surface. When a fish is spotted, the osprey dives feet first into the water and is completely submerged below the surface. After diving in and clutching their prey, they must get up to the surface of the water, and generate enough power to rise out of the water and take flight, all while carrying prey that is half or more of the raptor’s weight. That simply cannot happen with a damaged shoulder. Remarkably, this little fighter amazed us with his progress! 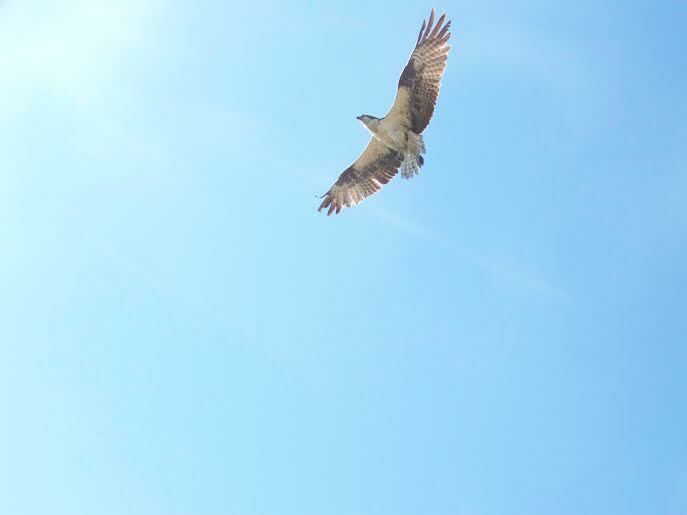 Since we don’t have a lake brimming with trout to test our Osprey prior to release, on Day 20 we placed him in a 50’ flight enclosure. This would test his flying ability, maneuverability and strength, to prove if he could make it in the wild. We want the birds to stay feisty and full of spirit, and to fight for their survival, because that’s what it takes to succeed and “make a living” in the wild. And he was ready. His flight was strong, smooth and graceful, and there were no signs that the devastating injuries were hampering his flight! He banked the turns, shoulder and hip working perfectly; he flew with great control and nailed his landings. 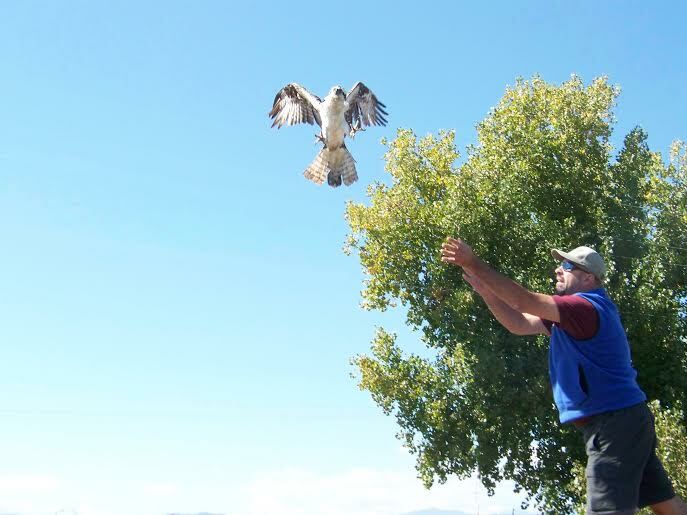 It was time for his release, and with Osprey winter migration coming, timing was essential. Just 28 days after arriving badly broken, we returned him to the site where we found him. Mike wrapped him securely and held him for the drive back to the Martin Marietta concrete plant. 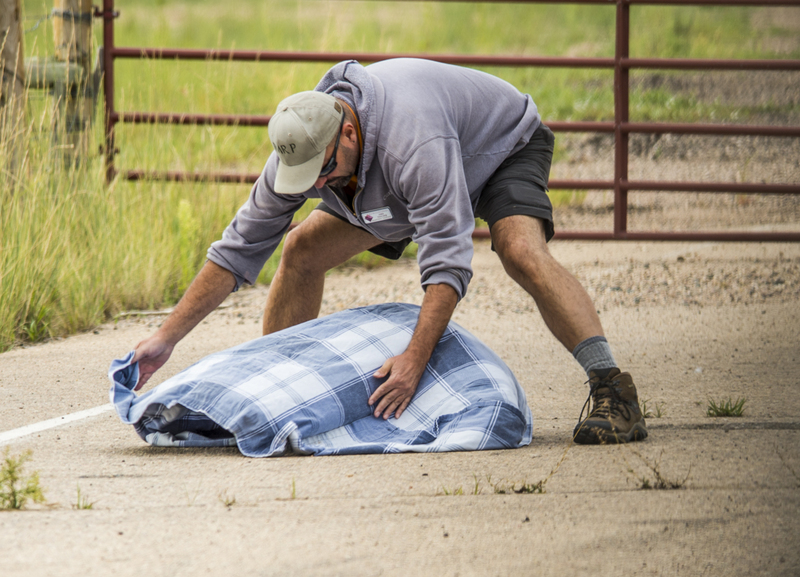 When we reached the release site, Mike unwrapped this survivor and with a gentle toss, released him into the wind. Instinct took over as he rose to the east on steady and strong wing beats, then circled back west, flying over us, which we took as a thank you. He then disappeared over the horizon. Three hundred times every year, we answer the phone and hear that another bird is in distress. But our Rescue and Rehabilitation team accepts every single raptor, no matter how challenging. 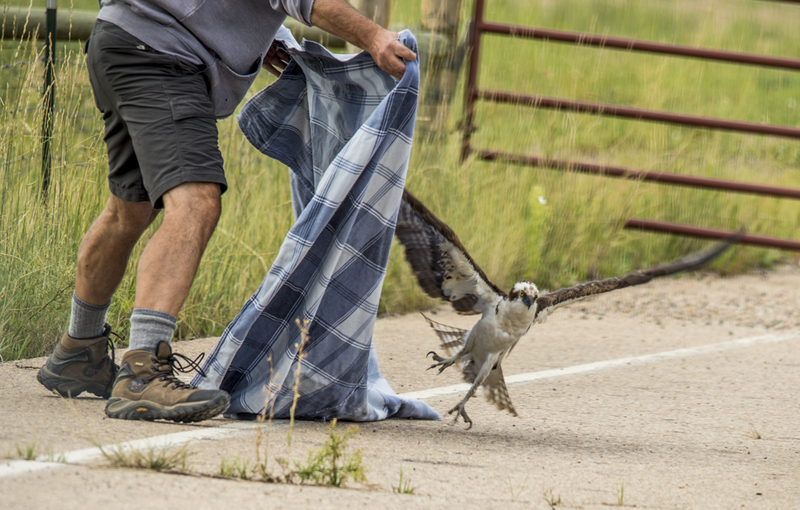 The Rocky Mountain Raptor Program has been rescuing raptors in northern Colorado for more than 30 years. Our 6 fulltime staff members and 140 dedicated volunteers are dedicated to caring for injured birds of prey so that they may return to the wild. Our environmental education program brings nonreleasable raptors into classrooms and to fairs and events throughout Colorado to give people the opportunity to learn about birds of prey “close up and personal”, and find out how we can all be better stewards of the planet. The RMRP is not supported by any governmental funds – we are funded by gifts from individuals who believe in our work, and who value the sight of an eagle touching the sky. We cannot do this work without the support of our community. To help the birds, or to get involved, go to www.RMRP.org or call 970-484-7756.